Because of a recent update, we're now requiring applications to be complete before they are submitted. Before, applicants could submit their applications before they were complete, but the rules around editability were confusing to them. Now, applicants can submit only if all document requirements are complete (or with letters of recommendation pending). Because of the update, you will not be able to create requirements for 2 different sets of applicants. Example: Applicants at the rank of Assistant Professor should include three reference letters and Associate faculty candidates should include a list of three references. Instead, to accommodate this type of search, you’ll want to create “optional” requirements for your applicants. To create “optional” fields for your applicants, you’ll first need to jump into the position and select the edit option. Ultimately, you’ll need to edit the number of documents required to zero. 1. 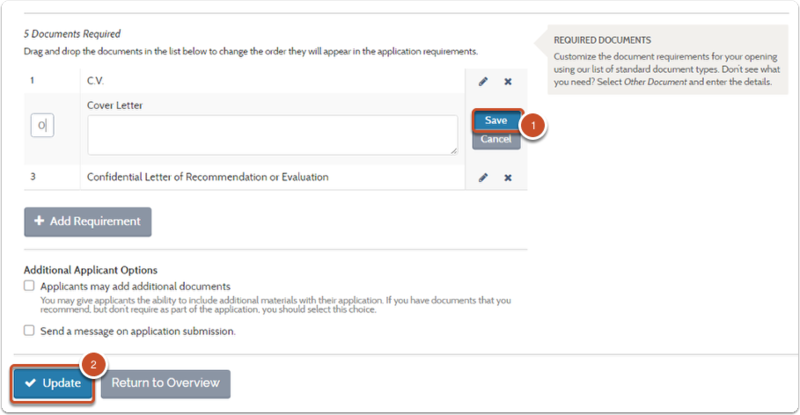 On your Edit position's (position review page), select "Required Documents"
4. Select "Save" then "Update"